handheld readers, fixed-mount readers and verifiers. Cognex Announces Distribution Agreement with FPE Automation, Inc.
Cognex Corporation (NASDAQ: CGNX), the world’s leader in machine vision, is announcing a partnership with FPE Automation, Inc. as an ID Automation Solution Provider supporting accounts Illinois, Northern Missouri and Eastern Iowa. With unique solutions for industrial environments, Cognex and FPE Automation are partnering to offer world-class service to customers in the (select focus or relevant industries, ex: automotive, aerospace, consumer electronics, consumer products, medical device, pharmaceutical, life sciences, document handling, food and beverage, robotics, solar, retail distribution, logistics, etc.) industries. Cognex products include barcode readers, machine vision sensors, and machine vision systems that are used in factories, warehouses, and distribution centers around the world to guide, gauge, inspect, identify, and assure the quality of items during the manufacturing and distribution process. Cognex Corporation designs, develops, manufactures, and markets a range of products that incorporate sophisticated machine vision technology that gives them the ability to “see.” Cognex is the world's leader in the machine vision industry, having shipped more than 1 million vision-based products, representing over $4 billion in cumulative revenue, since the company's founding in 1981. Headquartered in Natick, Massachusetts, USA, Cognex has regional offices and distributors located throughout the Americas, Europe, and Asia. For details visit Cognex online at http://www.cognex.com. Cognex, DataMan, 2DMax, and Hotbars are registered trademarks and PowerGrid and 1DMax are trademarks of Cognex Corporation. Plastic Bottle Blowers - NEW from PHD: A stretching cylinder that mounts in the same space, but does more! PHD is pleased to release the Series BCSU Universal Stretching Cylinder for the plastic bottle blowing industry. The new Series BCSU Cylinder expands our proven series of Sidel® solutions. Series BCSU Universal Stretching Cylinders are direct replacements for Sidel® Universal Machines. These cylinders mount into the same space and bolt patterns, provide significantly longer service life, and reduce maintenance and downtime in stretch blow molding applications. Units are field repairable and feature alloy steel piston rods and urethane piston and rod seals for maximum life and durability. In 1963 Fluid Power Engineering Company Inc. was founded by Richard Bardos and James Murphy. Together they hand selected the best pneumatic product lines and people to service Northern Illinois and Eastern Iowa. Over time, the company has successfully transitioned the business to the second generation, with the third generation in place to secure our future. Throughout the years as our customers’ requirements have changed along with technology, Fluid Power Engineering changed as well. We have expanded our original territory and opened an office in St Louis and now provide our services to Eastern Missouri as well as the entire State of Illinois and Eastern Iowa. 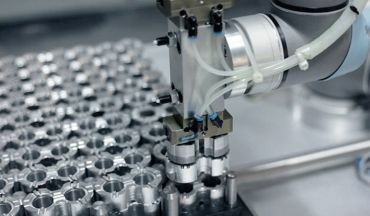 We have become not only a provider of pneumatic components, but a supplier of Pneumatic and Motion Control Solutions with our core competency to supply our customers with total Automation Solutions to enhance their equipment’s performance, reduce down time, and help them be more competitive in their respective markets. Our employees, customers and suppliers are paramount to our success and our future. The products we represent are best in class and provide many years of reliable performance. Our highly trained and skilled staff, working in harmony with our customers and suppliers, come up with solutions that dramatically affect the relevance of our customers in their marketplace. With that in mind, Fluid Power Engineering Company, Inc. is now FPE Automation, Inc. The name change more clearly identifies our overall core competencies as an organization. The three arrows in our new logo represent the three key areas ‐ people, products and solutions ‐ and the center ring is representative of our valued customers. No action is required on your part. If you prefer, you can continue to address all correspondence to Fluid Power Engineering Company, Inc. Both are correct. The addition of Universal Robots' UR5 robot arm has allowed Boog Machining to handle low-weight pick and place tasks while freeing up employees to complete other duties. The robot paid for itself in just one year. The BOOG Machining Company (France) specializes in short production runs of small milling, turning and machining parts. In order to increase productivity, they were looking for an automation solution that could quickly and easily be programmed and deployed into various stages of production to perform a wide variety of tasks -- while improving the daily lives of their 15 employees. BOOG was looking for ways to prevent and reduce work-related health problems because of production tool operation. The company wanted a user-friendly, affordable and re-deployable robot that was viable for small-business environments and applications. BOOG selected a UR5 robot from Universal Robots due to its ability to handle small parts (weighing less than 5 kg). The UR5 allows BOOG to streamline the production process dramatically and now has an employee load and unload the machine every three hours -- instead of having the machine constantly monitored as before. This frees up valuable resources to add value to other stages in the production by taking on multiple tasks. It also helps to prevent employee injury as the robot handles small, sharp pieces that can cause accidents when handled improperly. Low-weight collaborative processes, such as: picking, placing and testing are all perfect for the UR5. "In a record time of half a day's training, all operators were able to learn how to use the management software and to reprogram the robot. 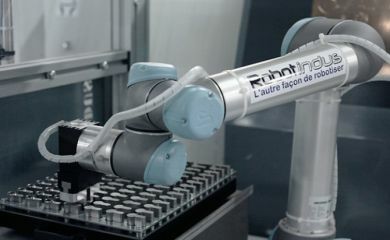 The UR5 robots are really easy to program and to reprogram thanks to their touch screens, intuitive graphic interface and management software," said Raphaël Schwartz, a design and method engineer within BOOG. Since the installation of the first Universal Robots robot in late 2011, BOOG has not faced problems of production downtime due to human/robot interaction and has added two additional UR5 units to the production chain. The payback period for each robot is only one year. Would you like to schedule a visit with our traveling UR robot? We'll bring it by so you and your colleagues can see it work live and in person! Contact your FPE Automation solution specialist to set up a time to see how UR can work for you. Launch of piCOMPACT®23 - A product that revolutionizes the market of air driven vacuum pumps! Do you want to eliminate vacuum related downtime in your production? The piCOMPACT®23 is now being complemented by the new even more powerful and larger COAX® SX42 cartridge. With both SX12 and SX42 in place, the piCOMPACT®23 family is complete from a vacuum performance point of view. The capacity span will cover single-stage ejectors from 1.2mm – 3.0mm and still offer up to 50% lower energy consumption. An additional “top silencer” is also released to suit the SX42 (needed for all piCOMPACT®23 with SX42). The piCOMPACT®23 will be launched globally on www.piab.com and also orderable from FPE by September 21st with an estimated delivery time of 3 weeks. Stay tuned for even more new features! Download/view the piCOMPACT®23 brochure in PDF Format.